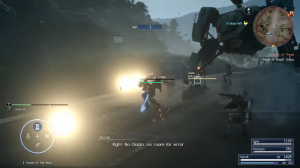 This page contains a detailed walkthrough of Chapter 7 – Party of Three in Final Fantasy XV, including quests, objectives, items, enemies and bosses encountered in the game. 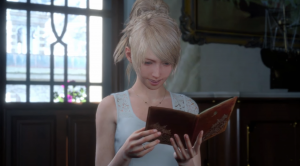 The chapter starts with a cutscene where Lunafreya receives a letter from Noctis telling her that he has received the blessing. 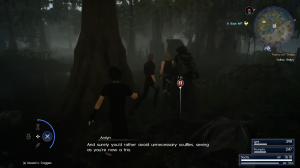 After several days, Noctis, Ignis, and Prompto sets out on a journey to find a mythril ore. It is said that mythril can be found in the Steyliff Grove. At about 0.76mi. away from Steyliff Grove, there are battery soldiers blocking the road. Defeat the soldiers to proceed. There are Yellowstone, Greenstone, and Bluestone Crystals on a rock at the east of Steyliff Grove. However, there are also monsters in that path, so be careful. When you reach the entrance of Steyliff Grove, Ardyn is there waiting for you. Before heading inside, go to the left of the entrance to get a Rare Coin. Follow Ardyn while in the grove. At the entrance of the dungeon, Ardyn tells the group to wait. 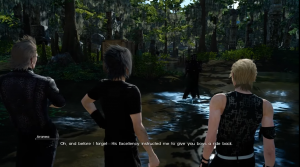 He convinces Aranea to accompany you inside the area. 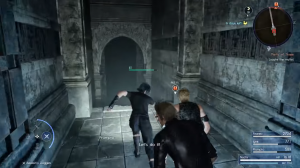 Ardyn tells the group to approach Arenea if they want to go inside. Before speaking to Aranea, talk to the soldier in front of several wooden boxes. This soldier sells items and weapons. After buying the items that you need, speak to Aranea. 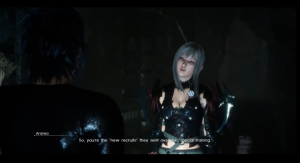 Aranea tells the group that they are the “new recruits” and going inside the dungeon will be a “special training” for them. After the conversation, Aranea Highwind will join your party. The dungeon in Steyliff Grove is quite linear, so you won’t get lost while traversing the area. There are several enemies that will impede your progress inside the dungeon, and these enemies are Creme Bulees, Skeletons, Reapers, and Liches. Chrome Bit – The room at the south of the second hall after you go down the long stairway. Rusted Bit – To the left after you open the first door in the dungeon. Rusted Bit – At the middle of the hallway after you using the stairs to B2. Mega Phoenix – After you open the second door in the dungeon, jump down and head to a dead end to the right. Mythril Shaft – Inside the room after opening the third door. You can access this area after defeating the Iron Giant. Ether – At the left before entering a large hall at B3. Phoenix Down – At the room to the right of the hallway after going out of the large hall. Talisman – At the room to the north of the hallway. Oracle Ascension Coin – At a dead end to the right before heading to the hall where you fight Quetzalcoatl. Iron Giant’s attacks are very easy to avoid due to his slow movement speed. Use a spear to get an advantage over the giant, as you will be able to move around the area easily using Shift Break. Be sure to always avoid the Iron Giant’s attacks as it deals massive damage. The boss will also summon other enemies before the start of the battle, so keep an eye out for them as well. Quetzalcoatl is a flying enemy, so it is very difficult to land an attack against it. However, you can deal massive damage by using Blizzara, the magic that the boss is weak to. You can also teleport through high vantage points in the area to attack Quetzalcoatl, so use these vantage points to your advantage. After defeating Quetzalcoatl, proceed to the end of the hall to find the Mythril Ore. Once you obtained the item, go back to the entrance of the dungeon. 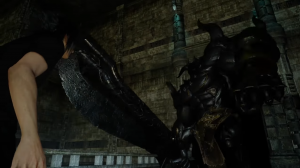 When you are outside the dungeon, Aranea leaves your party, but she offers a ride back to Lestallum where Cindy is waiting. iirc, you need to access it at nighttime like costlemark dungeon. wait for it to glow red on its windows. How can you enter the steyliff grove again? It’s locked after the mission, need to get the lich bounty there..